Face it! Cooking a whole bird can be challenging. Even Julia Child chopped her turkeys (and other fowl) into pieces for cooking. 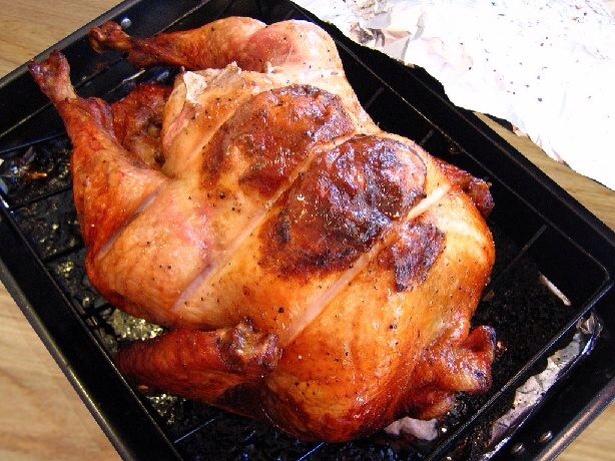 When you cook it whole, to get the dark meat fully cooked you risk having dry, overcooked breast meat. One solution that has been around a while is “flipping the bird”. Cooking a turkey breast side down allows all those luscious juices from the bird to drain into the breast, keeping the breast moist and allowing the dense dark meat to get all the heat it needs to cook perfectly. 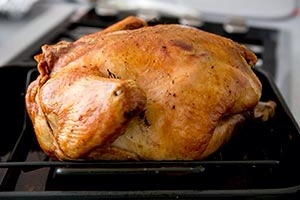 I first heard about the upside-down turkey from Chef Ann Nolan of Jenn-Air. She's such a gem. Here's the catch. (There's always a tradeoff, isn't there?) If you cook your turkey breast side down you will not get that wonderful dark brown crispy skin covering the bird's breast. So sad. Here's a workaround. Some upside down turkey recipes call for flipping the bird back after a half hour…other recipes call for flipping the bird only when there is a half hour of cooking time left. I prefer the latter. It does help with the browning, but you're likely to have oven rack marks. A more extreme approach is to wait until the bird is about done, flip it over, and turn on the broiler for a couple of minutes to brown and crisp the top. If you choose this method keep an eye on your turkey. It could burn very quickly and even catch fire. Unless you are going for a Norman Rockwell presentation, don't worry about the breast skin color or crispiness. You're going to carve that sucker anyway. If someone needs the crispy delicacy of the skin, there's plenty of well-done skin on the dark meat. The outcome of all this is going to be an awesomely delicious Thanksgiving turkey. Stay-tuned to this station for advice on turkey carving. This entry was posted in Cooking, Holidays and tagged Ann Nolan, chef, cooking, Jenn-Air, oven, oven rack, Thanksgiving, turkey. Bookmark the permalink.